Have you heard of stories before about the Catholic Church? We’ll there are a lot of stories that we’ve heard probably from our grandparents, from people who have witness or at least like us have also heard some stories. The movie is all about Philomena, who was an innocent teenager who was left by his father in an orphanage and grew up there with the nuns. Because of that, she didn’t know that there is something more than kissing (or will proceed after kissing – a lot) that will get you pregnant. Probably the nuns did not talk about that to them because they’re conservative, unlike these days a grade school student knows how to make a baby – not the total specifics but I think they get the idea. Anyway, to summarize it she got pregnant, she gave birth at the orphanage, and her baby boy named Anthony Lee was “adopted” by the Americans who can’t have kids without knowing who are his adopted parents are. So the movie will then show you how she dealt with her longing to her son, how she tried to find him and have they now met? I’m fund of these British movies, love the accent. That’s why I think I love watching Sherlock (TV series). The movie will make you hate the nuns (in the movie), I mean this is a true to life story and I have nun friends even though I am not a Catholic the nuns love me. It was years ago anyway, but they should’ve not done these things, for me it’s cold-hearted for them not to pity such a wonderful loving woman. 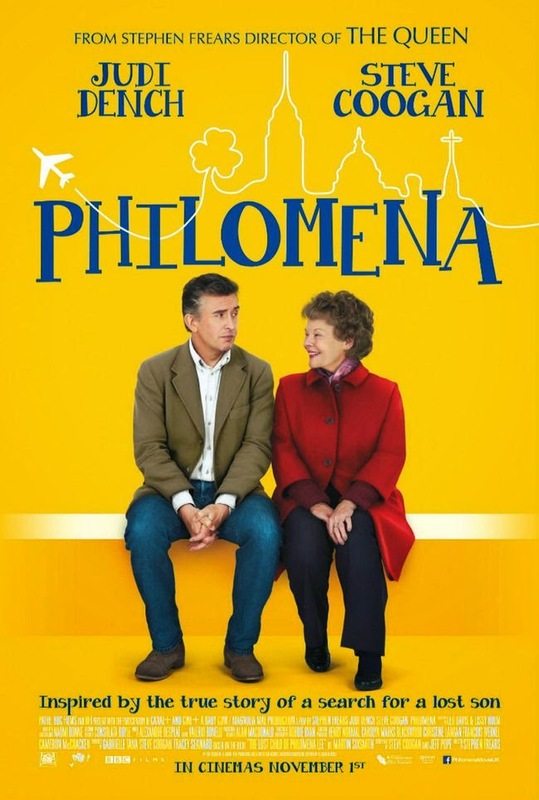 The movie is fun to watch by the way, Philomena is old and she’s very polite and nice to everyone and I love her. But then due to what happened to her and her baby Anthony, it’s heart breaking to see a loving woman being so heartbroken like this and this movie can surely make you cry, get a heartbreak and just hate the people who caused it – she’s a great woman! The story is awesome, the lesson is great and I will say it’s a must watch movie. Not because we need to be educated that we could have a baby after doing more than kissing someone, but there are lessons that we can learn from this woman, she remained strong, faithful to God – after what the nuns have done, and of course still remain positive and nice to everyone. I’ll totally give a 4.7 star rating out 5 stars to this movie, Judi Dench played her role very nice that she could make you cry and love Philomena more. I’ve only seen her on James Bond movies and did not expect her to do such a great job to a dramatic and touching story. The movie is a rated PG-13 so it means children under 13 should not watch this. I think it’s due to some words used by the characters, of course how will you react if you’ll be on Martin Sixsmith’s (the journalist) situation. But as a parent, this will let you know why you should talk about the “thing” with your kid. I mean, you don’t want her to be as innocent as Philomena. Not knowing about it can be funny at her age that she got pregnant but really, it did happened and we don’t that to happen to your kids. Play it or Skip it? I highly advise for you to watch the movie, especially if you’re into drama and true stories. And if you haven’t been to church lately, watch this movie. Maybe Philomena can convince you to go back and serve God. But please note this is a true story, so somewhere in the middle of the movie it may break your heart. I even cried and said “no…no way! Nooo! !....” while watching it. Philomena is still alive up to now by the way, actually she’s even at the Oscars – Ellen Degeneres announced her presence at the awards night. And yes, it was JUST Philomena. And oh, check out this photo of the all grown up Anthony Lee, the real Anthony and now known as Michael Hess. Just to spoil everything! LOL. Clue: Notice the Nun and the way he stand up. Check out the trailer, she's funny already. Watching it now, I want to cry again.